Young trees greatly benefit from the help of caring people to grow. Every tree added to our city helps to improve the environment, aesthetics, and human health. Before trees can do all of these great things, they need to survive as along as possible. Brewing a Better Forest is very grateful for the support and donations from these sponsors. If you are a brewery, local small business, other interested organization that would like to be a part of Brewing a Better Forest contact us here. We are proud to thank our sponsor 612 Brew for being the very first to agree to help inspire people to water trees. Stop into 612 Brew for one of their excellent craft brews. "Sociable is driven by a pretty simple vision. Sociable ciders are well carbonated, dry and always made from real apples. Simply put, they should be enjoyed like great draught beer." "...Fair State, Minnesota's first cooperative brewery. Our goal is to put the natural connection between brewer and community to work to create something that truly belongs to us all. Creating infinite community and quality craft beers." 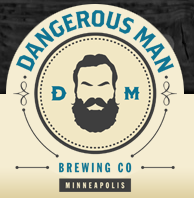 "We are a destination microbrewery & taproom located in NE Minneapolis. Our focus is high-quality, small-batch production beers with ever-changing taps. We are family friendly and welcome anyone from anywhere." "Able was started by a few guys who decided at an early age that they wanted to make things together. And now we are making something. There are lots of people that have helped along the way. In big ways and small. We’re all very much looking forward to brewing beer together, and then drinking that beer." "We are a full-service restaurant with an on-site craft brewery. We smoke virtually everything on our menu, from turkey, beef, pork to cheese and eggs! Our beer has received great acclaim for being edgy, full-flavored and overall well executed. If you haven't visited us yet, it's probably time you give us a try!" Craftsman-brewed ales & lagers for die-hard beer fans made inside the old Sears & Roebuck building. They always have something new on tap! Check them out today! "56 Brewing is a Microbrewery and Tap Room in Northeast Minneapolis located at 3055 Columbia Ave NE. We are a collaborative group of beer enthusiasts, some of us 15+ year NE Minneapolis residents, who value the city, the community, the people and the establishments as a place to work, live, bike, connect, play, grow and have fun. Our motto is “we make beer we like to drink”. Our goal is quality, consistency, and the ability to rotate beer styles efficiently. We strive to use only locally sourced ingredients whenever possible, always in our seasonal variations and infusions. Our focus is on community and beer lovers alike, highlighting NE Minneapolis and the brewery culture." "Co-founders Nate Herrington and Morgan Jappe joined forces to start a series of events combining their favorite things – being active, drinking beer, and supporting their community. " Pat's Tap is an excellent Gastro Pub and Skee-Club located in the heart of south Minneapolis. They are known for excellent food, great cocktails, a laundry list of excellent beers and for having a friendly neighborhood lively vibe! People for Parks is a non-profit organization created to stimulate financial and community support for Minneapolis Parks from citizens, businesses and organizations. They carry out special projects in cooperation with our donors and the Minneapolis Park and Recreation Board. Their purpose is to sponsor programs and projects that enhance and promote our city's park services and facilities. Open Twin Cities..."Open Twin Cities fosters an inclusive community of civic collaboration and champions open government and civic technology for positive social impact." 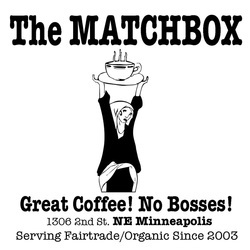 "Matchbox has been collectively owned and operated since 2003. With sandwiches from Chowgirls and bakery from mayday cafe. We also sell locally roasted and organic fair trade coffee as well as many other local items. And we are proud to compost."